Everyone has their go-to, comfort food dishes. One of mine happens to be risotto. I first made risotto exactly two years ago. My now-fiance and I were celebrating a year and a half of dating, and I was navigating the first few weeks of graduate school. Risotto always had sounded daunting – all that careful stirring – but being in graduate school made me feel up to the challenge. I was a big girl now – living on my own, in my own apartment, in a new city – and I needed a big girl dish in my cooking repertoire. I knew how to cook well enough when I started graduate school, but I wanted to expand my horizons. I could whip up a delicious spaghetti with tomato sauce and make yummy hummus, but I had never really pushed myself to make super fancy dishes. Honestly, looking back, I can’t remember what I used to regularly cook before I started graduate school; I was a great baker, but I had yet to perfect my recipes for sandwich bread, pizza crust, mac and cheese, pesto, roast chicken, risotto, and the variety of other dishes I frequently make now. So I embarked upon a culinary adventure on the weekend of Ryan’s and my year and a half anniversary – a whole roasted chicken with mushroom risotto. I used this risotto recipe and this roast chicken recipe and, amazingly, I cooked up some a pretty good meal for the two of us. Learning to make risotto opened me up to be more creative in cooking and learn more complex dishes. Sure, some of those recipes were failures – but risotto taught me how to try a recipe at least once. Two years later and risotto is one of my go-to dishes. It’s so comforting, so simple, so delicious, and it always makes me think of celebrations Ryan and I share as a couple. Sure, it requires close attention, but I find the constant stirring almost meditative. Add half a cup of broth, stir, stir, stir, repeat. I adore the versatility of this dish also – I’ve used white wine, red wine, and beer as the alcohol base to mix up the flavors. The options are nearly endless when it comes to vegetables – mushrooms for a rich and meaty taste, spinach for a nutritional punch, peas and asparagus for a lovely spring dish, and pumpkin or butternut squash in the fall. 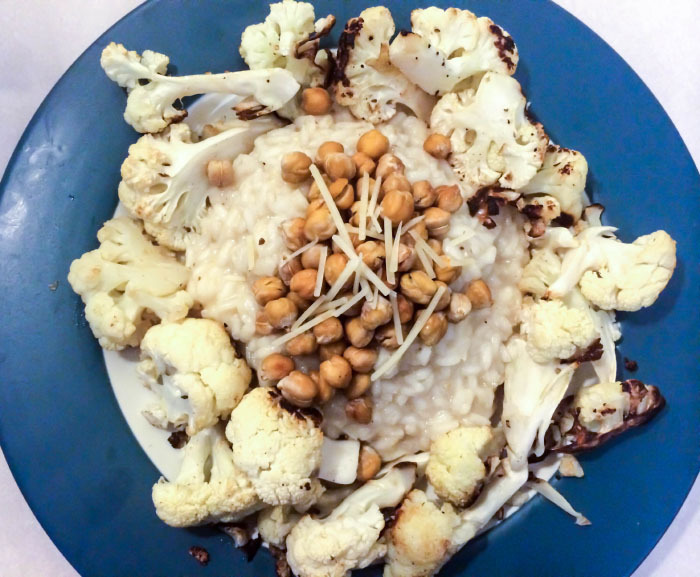 It can be a meat-lover’s risotto with bacon, or a vegetarian option like this Crispy Chickpea and Roasted Cauliflower Risotto. Cauliflower has been a staple in our fridge this summer. Thanks to the cooler temperatures this summer, we’ve been roasting it – bit of olive oil, bit of garlic, bit of salt and pepper, and into the oven. Okay, lots of garlic. It may not be the prettiest vegetable, especially when you serve it up with another white food like risotto, but it just tastes so good – crispy and caramelized and garlicky. Speaking of crispy, I’m years behind here and finally made crispy chickpeas earlier this year. Have you tried these? They’re so crunchy and buttery! We’re a bit obsessed with them over here and put them in salads, stuff them into baked sweet potatoes, mix them into pasta dishes. While you can add tons of different spices to them, I think they taste so good with just a dash of salt and a shake of pepper. It was a rainy night here the other night, and wedding planning stress was taking its toll, so a totally warm and comforting meal was in order. I almost always have the ingredients for risotto on hand – I keep a big container of arborio rice and some chicken stock in the pantry, and then use whatever beer or wine we have on hand along with whatever veggies are in the fridge. 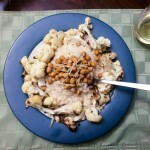 This night, I had a fresh batch of chickpeas and a gorgeous head of cauliflower in the fridge. So I cranked up the oven, tossed the chickpeas and cauliflower onto roasting trays and into the oven, and began that meditative stirring. Add liquid, stir, stir, repeat. Add liquid, stir, stir, repeat. It’s almost as meditative as running. 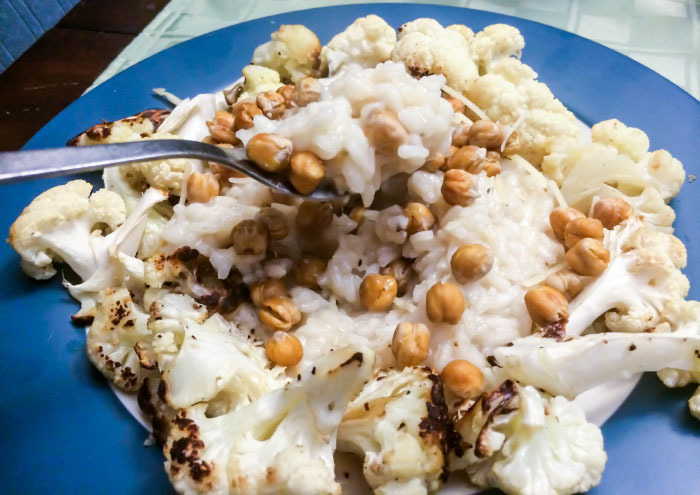 The smell of this Crispy Chickpea and Roasted Cauliflower Risotto is incredible – the shallots especially release a mouth-watering flavor as this thing cooks. And it tastes even better than it smells! 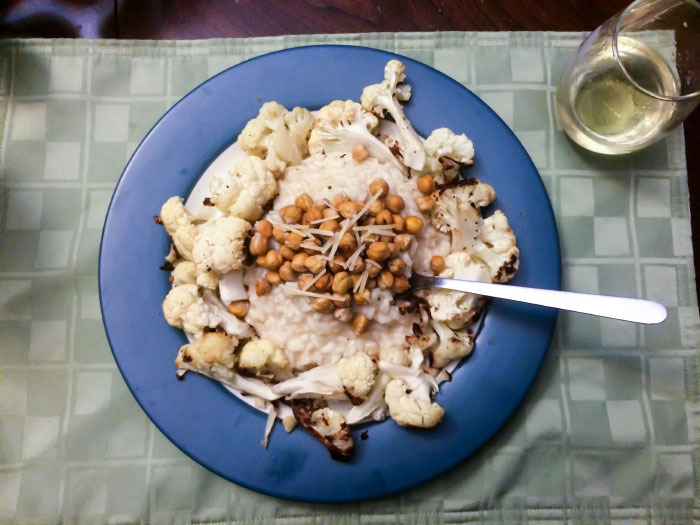 The crispy chickpeas perfectly compliment the creaminess of the risotto, the garlicky cauliflower highlights the wine and shallot flavors, and each bite is warm, comforting, and a little piece of cheesy heaven. 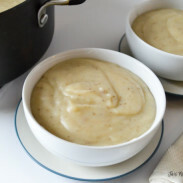 Toss cauliflower florets with 1 tablespoon olive oil, minced garlic, salt, and pepper. Spread on a roasting pan and put in the oven. I let this roast the whole time I was making the risotto, about 30 minutes. 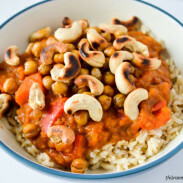 Toss chickpeas with ½ tablespoon olive oil and spread on a roasting pan. Put in the oven to roast for 20-25 minutes. Remember to gently stir the cauliflower and chickpeas every 10-15 minutes to ensure even roasting. Meanwhile, melt 1 tablespoon of butter in a saucepan on the stove over medium heat. Once sizzling, add the shallot and cook for 3-5 minutes. Then add arborio rice and toast for two minutes. Pour in wine and stir until the wine has absorbed into rice. Add the chicken broth, half a cup at a time, and stir continuously until absorbed before adding the next half cup. The risotto is done when all the liquid has been absorbed and the rice is fully cooked. Season with salt and pepper and stir in parmesan cheese, and then remove from heat. 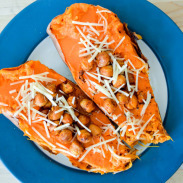 Serve with chickpeas and cauliflower, and top with more parmesan if desired. Fast forward two years from when I first made risotto, and Ryan and I are getting married in less than two weeks! Three and a half amazing and joyful years together, including three graduations, four cities of residence, and one sweet little puggle. I’ll keep making us risotto, as we celebrate the significant and the small things together.